PEARL HARBOR, Hawaii - Adm. Cecil D. Haney, commander of U.S. Pacific Fleet (PACFLT), Sailors and guests commemorated the Battle of Midway in a solemn ceremony at Pearl Harbor headquarters June 7. Widely recognized as the turning point of World War II in the Pacific, the Battle of Midway was fought June 4-7, 1942. The U.S. Pacific Fleet sank four enemy aircraft carriers, a decisive blow from which the Imperial Japanese Navy never recovered. Haney drew the lessons of Midway at the ceremony marking the 71st anniversary of the battle. "The Navy intelligence and cryptological team were key to winning the victory at Midway. Our nation owes them a debt of gratitude, not just for the advantage they gave us then, but for their legacy that continues to live on today," Haney said. "Americans were filled with an overpowering sense of patriotism…our nation was in peril and readily volunteered to join the fight. Many contributed their sweat, muscle, blood and even their lives in sacrifice for our nation but an unusual and important group of men here in Hawaii contributed their mental abilities as they worked diligently to find a way to break the Japanese code. Because they were able to break that code, they were able to determine exactly when and where the surprise Japanese attack would strike, this allowed us to set our own trap for the Japanese." The key to the U.S. victory was the interception and decryption of Japanese plans by naval intelligence specialists in Hawaii, including Station Hypo, the radio intercept station in the basement of Pearl Harbor's Building 1. Knowledge of Japan's intent allowed Adm. Chester W. Nimitz, U.S. Pacific Fleet commander at the time, to have his carriers ready and waiting for the Japanese at Midway. Capt. 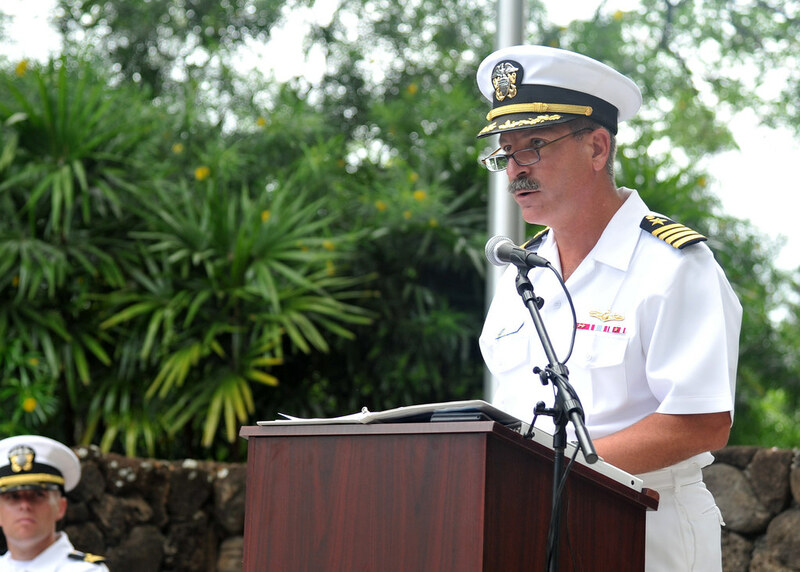 James Fanell, PACFLT director for intelligence surveillance and reconnaissance capabilities division, reflectedt on the importance of Intelligence gathering during the Battle of Midway. "This battle was by any measure the most significant Naval victory in American history, and clearly the turning point of WWII, therefore it's important today that we stop and remember not only those who fought and died at Midway for the service of our nation, but also to remember the unsung heroes who provided critical intelligence to the Pacific Fleet Commander, Adm. Chester Nimitz," Fanell said. " As he himself said, 'Midway was essentially a victory of intelligence, when attempting to surprise, the Japanese were themselves surprised thus turning the defeat of Pearl Harbor on Dec. 7, into a pivotal success history has taught us this battle turned out to be.'" 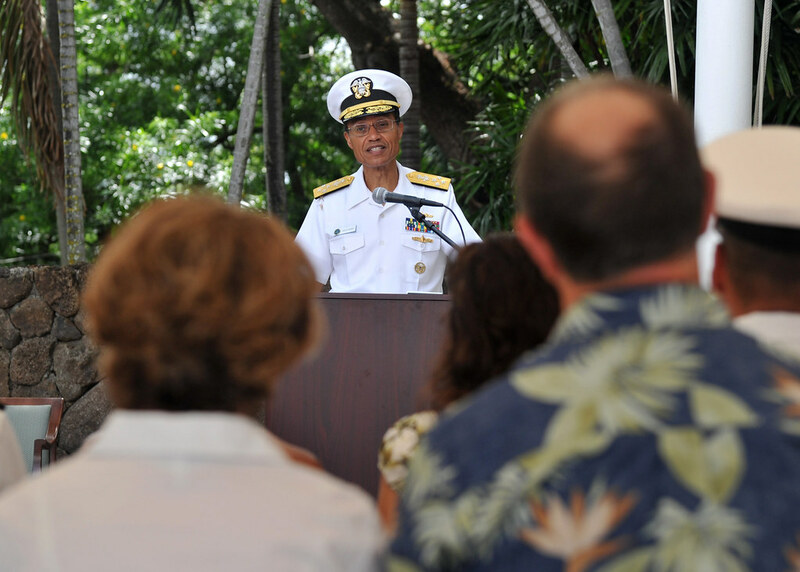 During the ceremony, Haney remembered Rear Adm. Donald Showers, who served in the combat Intelligence Unit Station Hypo during the Battle of Midway and attended last year's Battle of Midway commemoration ceremony. "He explained how their team intercepted 500-1000 Japanese radio messages per day in May 1942 and deciphered and translated roughly 25%, an astonishing feat that enabled them to conclude Midway was the target," Haney said. "Their efforts became what we now call operational intelligence, by providing insights to the enemy's intentions, this allowed commanders to make timely and effective decisions in operational planning that gave them a decisive advantage. As a result, we were able to aggregate the necessary forces in time and use surprise to our advantage in order to even the odds in this important fight." PACFLT's intelligence and operations directorate and naval intelligence professionals concluded the Battle of Midway commemoration with a wreath laying ceremony at the Station Hypo plaque on Joint Base Pearl Harbor-Hickam. "It won't be long before there are no more survivors of this important time in our history. It is up to us to make sure that their contributions to our nation are celebrated and remembered," Haney said. "Many of you in the Information Dominance Corps carry on the legacy of the Sailors of Station HYPO. This important commemoration helps keep the memory of their efforts alive. Each of you who wear the uniform represents those from each service who fought, sacrificed and ultimately won the Battle of Midway. As part of this all volunteer force, please do your part to continue this tradition. Although 71 years have passed, historians are still writing about the battle, military planners are still studying it and we continue to cherish every opportunity we have to commemorate it."